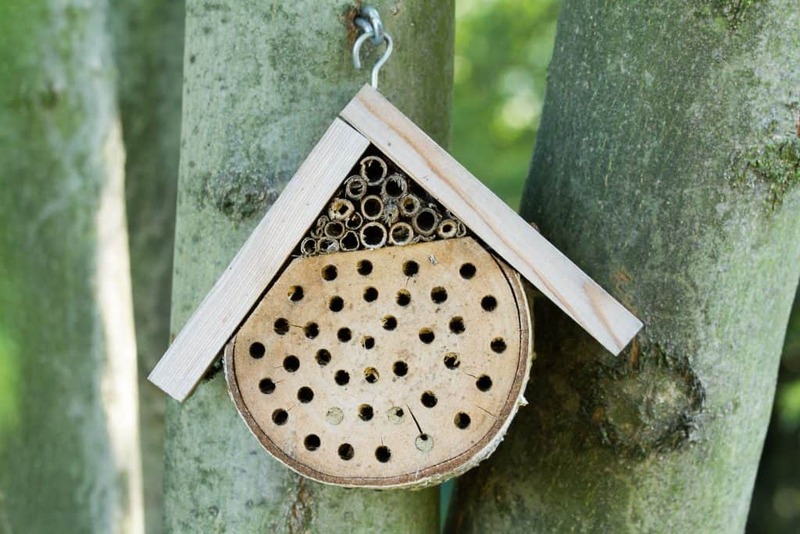 Bug hotels are a great way to start connecting with nature! If you’re looking to green up your outdoor space, entertain the kids, and be kind to the environment then an easy-build bug hotel is the best place to start. What Is A Bug Hotel? In their natural habitat insects hide away in nooks, crannies, and crevices to avoid predators and hibernate safely through the winter. Their habitats include holes in dead and rotting logs, inside hollow plant stems, beneath fallen leaves, and under cool rocks. Bug hotels replicate these habitats and provide snug and safe accommodation for our insect friends. By providing those dark safe spaces you become landlord to all types of minibeasts. Researchers say insects are disappearing at a rate of 2.5% a year and that over the coming decades we could lose 40% of our bugs. This is bad news because bugs help us no matter what you think of wasps and ants in the garden. Many insects pollinate our plants. They do it on a massive scale and keep the human food chain working. Insects are also a food source for other wildlife such as birds, hedgehogs, bats, and toads. In short, they’re one of the building blocks of life on earth and absolutely essential to our survival. But bugs are disappearing due to our agricultural practices, overuse of pesticides, and global warming. Insects are poisoned and they have fewer places to eat, breed, and hide. Why not welcome them into your very own bug des-res and help reverse their fortunes? What Bugs Live In Bug Hotel? There are millions of insect types in the world but the ones you’ll most likely attract in the UK are ladybirds and lacewings who both eat pesky aphids, spiders, woodlice, beetles, earwigs (no, they don’t climb in your ears! ), centipedes, millipedes, and solitary bees. Depending on the type of hotel you build you may also attract toads, frogs, and hedgehogs. At the very least they’ll be attracted to the insect meals within your hotel! What’s The Best Bug Hotel? Different types of insects have different accommodation needs. For example, bees need dry nesting conditions whereas beetle larvae need rotting wood to feed on. The best bug hotel is one that suits the insects you want to attract. Some should be dry and some should be damp – so maybe build several to cater for all our insects! By using natural materials, you can easily replicate the natural environments insects look for. Terracotta shards, slate, and stones create cool areas for beetles. Logs and dead wood are loved by woodlice, millipedes, and the totally amazing stag beetle. Fir cones, moss, dry leaves, straw, and hay create loose burrowing conditions for all kinds of bugs including ladybirds, bees, and spiders. Corrugated cardboard rolled into tubes attracts lacewings. Bamboo canes and hollow plant stalks are sought after by solitary bees who snuggle deep inside. So now we know insects enjoy varied environments here are a few different types of bug hotel you can easily make in a few hours. This is a multi-storey insect house that appeals to all types of insects because it has a variety of nesting materials inside. Pallets, or bricks and a few planks of wood, plus a flat piece of wood or plastic for the roof. To make the wildlife stack place your pallets on top of one another to a safe height, or if using bricks and planks, place four bricks on the ground, then a plank of wood, then four bricks followed by another plank and so on – just like a lasagne. Put the flat piece of wood or plastic on top to keep the worst of the rain out. When the structure is steady start placing your nesting materials inside. Put bamboo canes for bees on the sunny side, and terracotta or slate in the shade for cool-loving beetles. Pack it snugly, but not overly tight. You could put wildflower plant pots or a succulent garden on the roof to attract bugs too. If a wildlife stack seems like too much hard work or you don’t have the right materials, there are easier ways to build a bug hotel. A Gruffalo-style log pile house is perfect for wood-eating insects such as beetles, earwigs, and woodlice. Amphibians will enjoy the cool dampness too. Find logs online or at a garden centre if you’ve none lying around. Stack them lengthways to a safe height and shower them in dry, dead leaves or dead vegetation. If logs are too large for your garden collect up rotting wood, sticks, twigs and bark. Make a bundle and tie them together with garden twine. You can put this insect bundle up in a tree, tie it to a fence, or lie it on the ground in a cool place. Beetles, spiders, and millipedes will move in pronto. 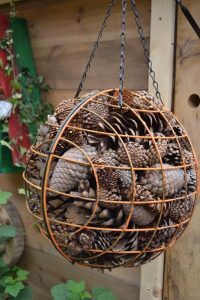 This is an effective insect house simply made from a string bag filled with pine cones. It makes a great hiding place for lacewings and ladybirds. 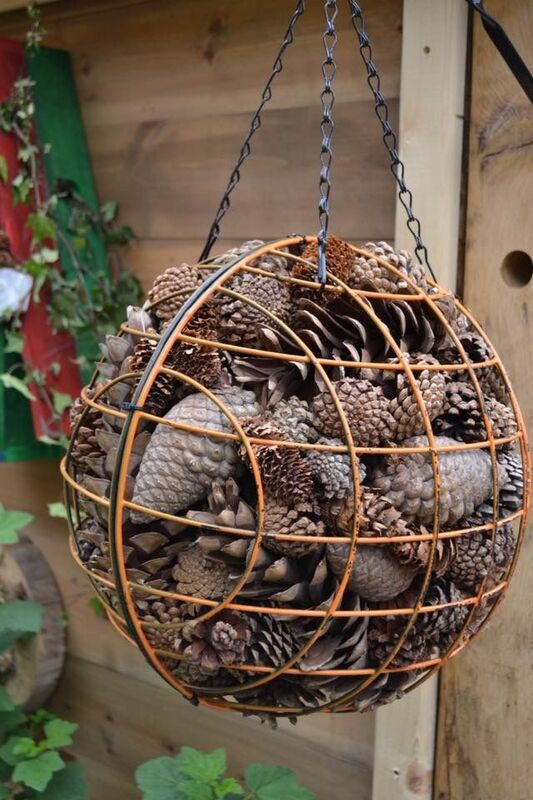 In autumn gather pine cones and push them together to lock the pieces. Then fill any gaps with dry leaves, moss, and twigs. Pop it all in a string bag and hang it in a tree. This is a low-cost home for ground-dwelling insects like beetles, earwigs, and centipedes. A cheeky solitary bee may move in too if it’s dry enough. Pack your terracotta pot with bamboo canes and hollow flower stems so it’s snug but not squashed. Cut the pieces to a length that ensures none hang out and become damp. Choose a dry, sheltered spot that catches winter sun and place the pot on its side to keep out the rain. You could build up stones on each side to stop the pot moving and attract even more insect squatters. This is a classic bee hotel that’s fixed to a fence line. You’ll need a little DIY experience to make this, but if you don’t have a drill or saw, you can buy them ready-made. Cut the plank into five pieces so you have two sides, a base, a back with a few centimetres rising above and below for fence fixings, and a roof. The roof should have a three-centimetre overhang for rain protection. Glue or screw a rectangular shape with the sides, base and roof pieces. Drill fence hole fixings into the top and bottom of the back piece. Cut bamboo to fit inside the frame. Lay the house on its back and fit the bamboo. The bamboo sticks will lock into place, so there’s no need for glue. Bamboo stems need changing each year to avoid fungal spread. Put your bee hotel on a fence that catches the morning sunshine. Alternatively, you can create a bee house by drilling holes of differing sizes into a square chunk of wood. It should be light enough to fix to a fence. Bee hotels need the backing of a fence or wall or they turn into wind tunnels. No one likes a draft on their back! 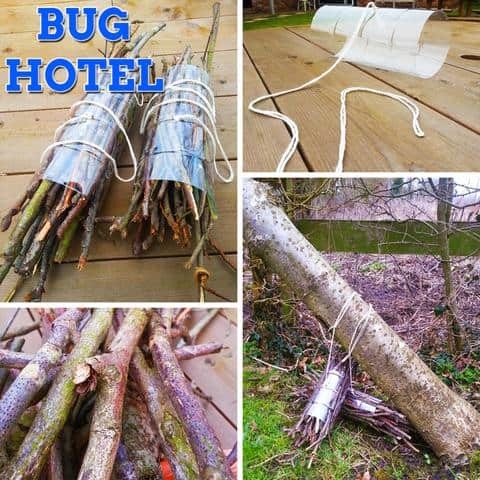 The very simplest and cheapest way to make a bug hotel! Cut off the bottle’s base. Make holes along the length of the bottle so bugs can creep in, and then stuff it with twigs, moss, dry leaves, and stems. Place your transformed bottle in a sheltered position on the ground with one end pointing slightly downwards to drain out any water. You can put stones or slate pieces in the bottle to weigh it down, or surround it with stones to prevent gusts of wind taking it across the garden. Insects usually like cool, moist conditions. Next to a hedge line, a fence, or under a tree are all good spots. Bee hotels should be attached a fence, house, or tree where they stay dry and catch the morning sunshine. Try to choose a place that will be undisturbed for least a year. Many insects hibernate and there’s little point creating a home only to turf them out when they’re fast asleep. When’s The Best Time To Build a Bug Hotel? Autumn is the point when bugs bed down for winter, but bug hotels are used all year round to hide from predators, lay eggs, and store prey. When you create a bug hotel they’ll make full use of the facilities no matter what the season. Throw away that no vacancy sign – your guests are here to stay. If your bug hotel has the right materials insects will eventually find their way, but you can speed up moving-in day with a few easy actions. Stop using pesticides. What is the point of making an insect home only to poison them with chemicals as they search for food? You won’t need chemicals anyway because a bug hotel attracts predatory insects. Ladybirds and lacewings eat hundreds of aphids a day. If you spot a ladybird put it on your roses or broad beans and watch it munch through the greenfly. You may have to wait a few months, but if you can hold out on the pesticides, predator insects will arrive to save the day. A water source will also help. This doesn’t need to be a pond. Heavy saucers filled with pebbles and topped up with water each day are lifesavers. Insects alight on the pebbles for a drink rather than drowning in the wide-open space of a birdbath or pond. Nectar is always in big demand so plant some flowers. Experts say the best bug-attracting plants are fruit trees. These can be fully-sized apple trees at the foot of your garden, or a specially bred patio plum tree. So long as it blossoms and fruits the bugs will be in seventh heaven. You could also place dead wood around your garden as that’s always appreciated by beetles, and leave areas of grass to go wild. 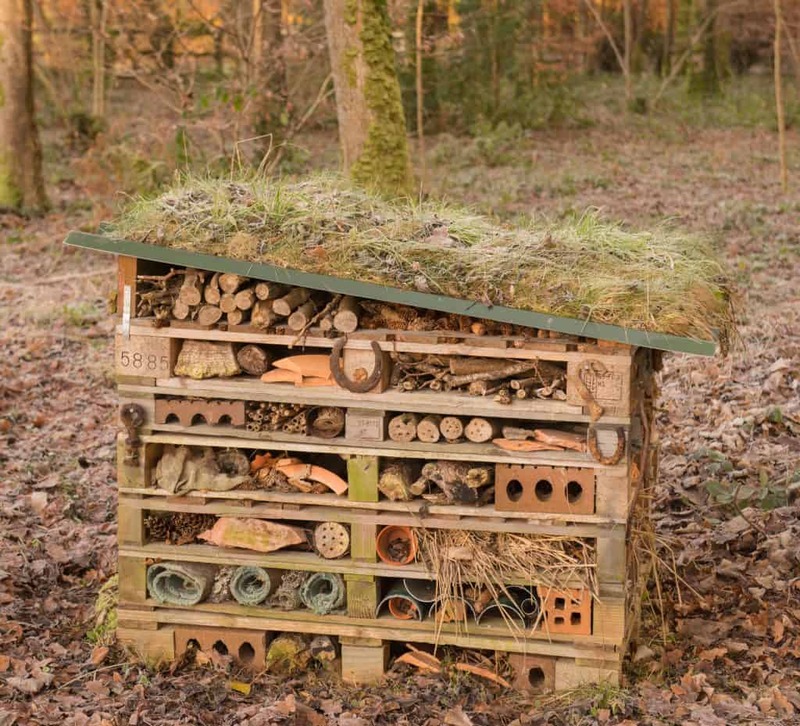 Building a bug hotel is the perfect way to introduce children to the natural world. It’s great fun and helps our dwindling insect population too. Head outside this summer and enjoy the fresh air alongside our essential insect friends. They won’t hurt you, and you’ll get a huge sense of satisfaction from helping them. David Attenborough would be proud – and you can’t get a better endorsement than that!